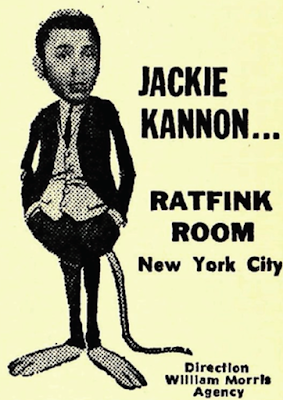 Jackie Kannon's Rat Fink Room - An Art Installation. Hipsters, Flipsters, Finger Poppin' Daddies... if you happen to be in Manhattan, come check out this incredible art installation - a recreation of Jackie Kannon's Rat Fink Room, the proto-comedy club of the mid 1960s bankrolled by mobster Morris Levy. I wrote about this venue years ago for WFMU and that article is now the basis for this real-life recreation. Details here.